One of the best parts about Netflix’s new She-Ra and the Princesses of Power is the roster of friends She-Ra made. The whole point is that she doesn’t do it alone, and she could hardly ask for better allies than Glimmer (Karen Fukuhara), Bow (Marcus Scribner) and Frosta (Merit Leighton). 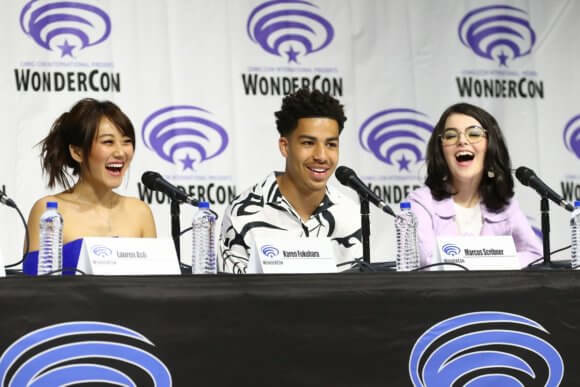 The trio of voice actors who play She-Ra’s allies spoke to reporters at WonderCon after premiering some exclusive scenes from the second season. The first seven episodes of season two premiere on April 26, 2019 on Netflix. Have you experienced any fan reactions from the first season? Having done the first season, was there anything different you wanted to do with your voices in season two? What are you excited about for each of your characters in season two? Karen Fukuhara: “You just mentioned it but at the beginning of the season Glimmer gives Frosta the cold-shoulder. She’s not really into the idea of their friendship, but we find out why. And I think the reason behind it is really touching as well. Other than your own characters who are your favorite characters and has that changed? Are there any moments while working on the voices that you discover something new about your characters or come across something you don’t think your character would say?